The Glasshouse – what I would describe as a “slightly posh pub”. Having said that, not the slightest bit pretentious. Clearly favourited by the locals. Highlights – The environment: The bar area is surrounded by cosy sofas and few fire places. The back of the pub opens out to a dining area and a backyard (great for summer time chilling). Free wi-fi available. Not so great – Being a family pub, there were a few crying babies in the midst. 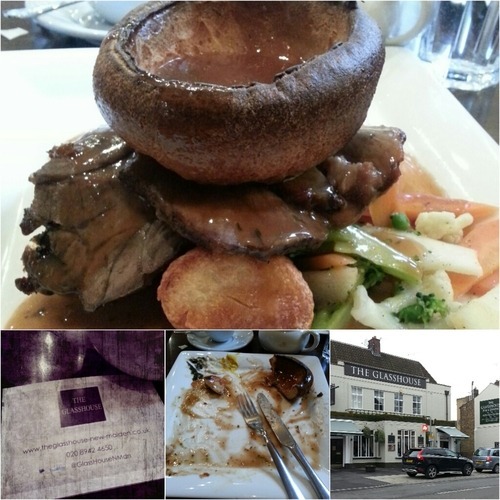 Food – Good quality roast lamb, crispy-out-fluffy-in roast potatoes and well cooked side vege. Subtle yet complimentary red wine gravy. I approve! Price – Good for a Sunday roast. Bordering high for pub lunch.